Find yourself in the world of volunteering! 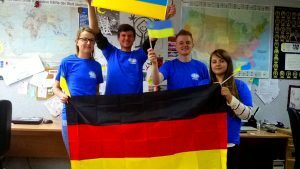 Welcome German volunteers to Ukraine! Welcome Elvira, Matthias and Helen – volunteers from Germany who arrived in Ukraine on a long-term volunteer program to work in non-profitable partner organizations and institutions. A former participant of a long-term volunteer program – Felix, has joined us and shared his experience of staying in Ukraine and gave advice to the newly arrived volunteers.